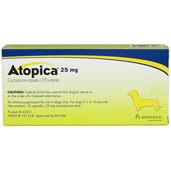 Shop for medications to treat your dog's flea allergy dermatitis at VetDepot.com. Flea saliva contains more than 15 antigens, all of which are capable of triggering an allergic response in your dog. A hypersensitivity to flea bites makes the parasitic infection considerably more unbearable for your dog. Severe itching typically results, and you may notice your dog biting at the base of his or her tail and scratching frequently and with significant force. Affected dogs may also lose some of their coat, have red and inflamed skin or scabbing, exhibit behavioral problems, and develop injuries or infections from excessive scratching. Of course, effective flea control is the first line of defense against flea bite allergies. Products such as Comfortis, Revolution, Advantage II, and Capstar offer fast action against fleas and lasting control against reinfestation by disrupting the flea life cycle. Talk to your veterinarian about which product is best for your pet. Do not forget to treat the other animals in the house. Also, inquire about whether you should follow a monthly flea control regimen to prevent recurrences. "Keep in mind that these topical products may minimize symptoms, but they do not treat the underlying flea bite allergy." If you have a recurring flea problem, obtain considerably better pest control with a product for environmental use. Use a flea powder or spray in your yard, house, and on animal bedding that is effective at killing adult fleas. A variety of shampoos, rinses, creams, ointments, and other topical products are designed to ease the symptoms associated with allergic skin conditions. Numerous different soothing, nourishing, moisturizing, anti-inflammatory, antipruritic, and other beneficial ingredients are incorporated into these products. Ask your veterinarian for a recommendation to relieve your dog's itching and other symptoms resulting from a flea bite allergy. Keep in mind that these topical products may minimize symptoms, but they do not treat the underlying allergy. 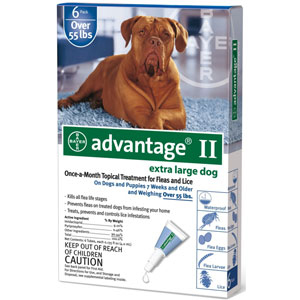 Moreover, they may not work for all dogs and may cause side effects, especially when used frequently over long periods. For significant or recurring flea bite allergies, your veterinarian may suggest a medication to reduce symptoms and prevent excessive scratching and suffering. Several options are available. For example, Atopica is a cyclosporine that inhibits the body's immune response and is often beneficial in the treatment of allergic skin conditions. Antihistamines such as Clemastine Fumurate block histamine to reduce the allergic response. 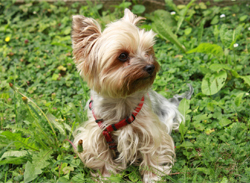 The best means of treating flea bite allergies is with avoidance of fleas. To do this, you must keep your pet, home, and yard free of fleas year-round.